Working at Gatwick, making a slow connection at Gatwick, overnighting at Gatwick? Ever had a need to fill in time while waiting at the airport and looking for something to do? BTN has perhaps found the answer. It is also good for a meeting or small conference just a little distance from the airport in a very quiet retreat. Last Saturday (6 April), Leonardslee Lakes & Gardens reopened to the public, the culmination of a two-year multi-million pound project on a 240-acre estate. From the Gatwck terminals it is a leisurely 20min (15 mile) drive. 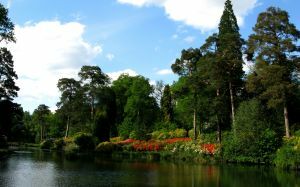 Described as "the finest woodland gardens in England", it has a fascinating history and is stunning. Allow for a half-day visit if you want to take in a lunch or a classic British afternoon tea. In the mansion, there is dining in the evening from Wednesday to Saturday. The Leonardslee property dates back to the reign of Charles II, but it was not until 1803 that the gardens began to develop into the superb parkland visitors see today. In 1852, William Egerton Hubbard bought the estate; built the present mansion and continued to develop the gardens, selling the property to his future son-in-law, Sir Edmund Loder. 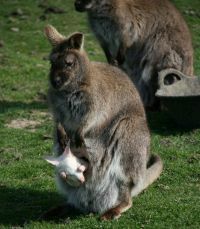 Sir Edmund further expanded the gardens and introduced a large collection of rare wild animals, including unusual species of deer, wallabies and a colony of beavers. Eventually, the Loder family sold the property in 2010, a new owner closing the park and quickly taking no interest in the historic acreage. In what she described as “a moment of madness” but clearly thoroughly enjoying the process, Zimbabwe-born entrepreneur Penny Streeter OBE, her honour awarded in 2006 for ‘services to enterprise’, bought Leonardslee in 2017. 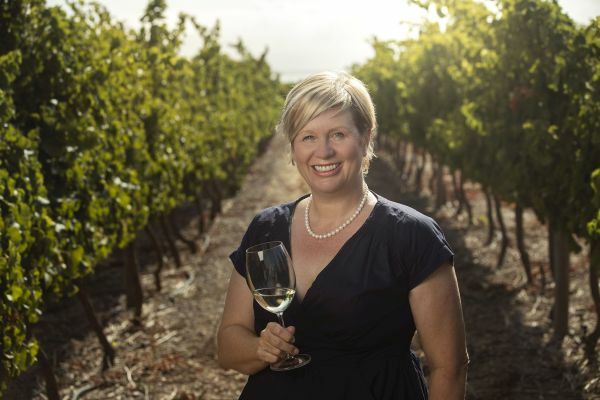 She is the owner of the Benguela Collection vineyard and hospitality group. 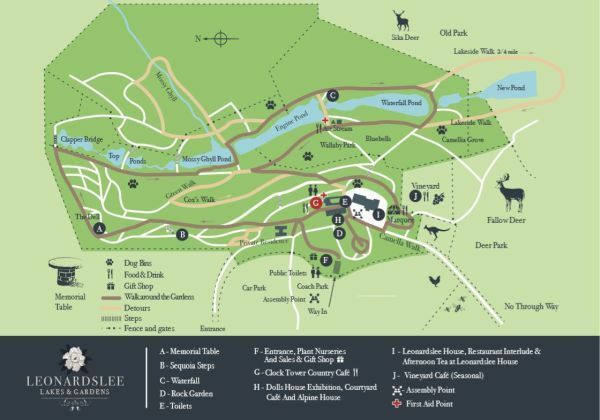 In addition to Leonardslee, it includes the 400 acre Mannings Heath Golf Course and Wine Estate, located three miles from Leonardslee, and Benguela Cove vineyard in South Africa, as well as four restaurants and a hotel on the Garden Route. The garden restoration project has been described as the largest of its kind since Heligan (Cornwall) in the 1990s. With no maintenance work carried out since 2010, it has required a team of up to 20 gardeners working since the summer of 2017 to carry out essential clearance and rebuilding work. Asked how much the whole restoration cost, Streeter would not give an answer. She probably does not know. “Plenty” was all she would say. 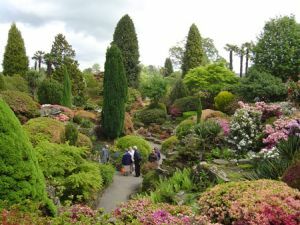 General manager Adam Streeter says that work by head gardener Ray Abraham has included inspection and extensive rebuilding of some 10 miles of pathways that had collapsed down into the valley in which the gardens are set; also cataloguing some 10,000 trees and carrying out tree surgery where necessary. 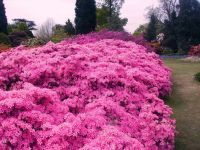 Sir Edmund and his descendants had done a remarkable job in collecting an outstanding display of , azaleas, camellias, magnolias and bluebells, collected from all over the world from the early 1800s. Modern technology and Google has helped with the classification. Set in a steep-sided valley, the estate offers visitors a rare combination of lakes, woodlands and parkland walks to enjoy. The garden team have recorded 95 champion trees including a specimen of the critically endangered Abies Nebrodensis (Sicilian Fir); with only 30 left in the wild, seedlings will be shared with Kew Gardens to preserve the species. The project takes full account of the ecological sensitivity of the site in a plan that creates locations where bats, newts, butterflies, bees and other species can thrive. This includes leaving areas of uncut grass, and log piles that serve as bug hotels, with new nature trails for children and school groups to see the diverse wildlife at Leonardslee. The gardens were used for filming several exterior scenes for the 1947 Michael Powell and Emeric Pressburger film Black Narcissus, which is set in the extreme north of India. The soil is damp and slightly acidic, well-suited to rhododendrons, camellias and magnolias. It is the home of the original Loderi Rhododendron, named after the owner of Leonardslee in the early 1900s. The grounds are set in a steep-sided valley and feature a series of seven man-made ponds, which contain a colony of carp, and were used in the 19th century to provide water power for the iron industry. There is an acclaimed Pulham rock garden built in 1890. A jewel in the crown of the estate, it features a series of rocky outcrops which combine natural sandstone with artificial Pulhamite rock, intensively planted with hummocks of azaleas, dwarf rhododendrons and dwarf conifers. The 19th-century, Grade II Listed house sits on a natural terrace above the steep west side of a valley, with wonderful views east and south over the gardens to the South Downs. The two-storey, Italianate house was designed and built from 1853 to 1855 by T L Donaldson. The ground floor opens out on to a grand hallway with detailed flooring and an ornate open staircase with internal Tuscan columns. Leading directly from the main hall is a spacious function room for classic afternoon tea and a dining room, the location of Restaurant Interlude. 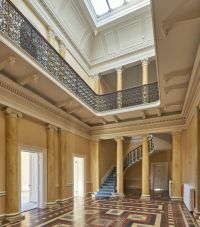 The first-floor landing overlooks the main hall and features an open windowed ceiling, which floods the area with natural light. This then leads into a number of function rooms, converted and equipped for private hire. The unique ‘Beyond the Dolls' House’ exhibition is located by the main courtyard. 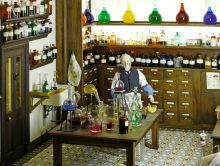 Created by Helen Holland in 1998, and now restored, the exhibition will become a major attraction for visitors. The collection depicts the Edwardian estate and neighbouring villages at 1/12th scale with landscapes and characters acting out day-to-day activities. Exquisite in detail and accuracy, a six-foot-tall person is recreated as six inches in height. As you pass through an estate it takes shape in the form of a mansion, entrance lodge, farm buildings, granary, farm garden, topiary garden, kitchen garden, gardener’s cottage, walled garden, stable yard, keeper’s cottage, and stable yard, and completed with a market town of various shops, trades, a pub and a church.. Many of the tiny miniatures actually work and you can see Edwardian staff dusting down lights, a remarkable and minuscule toy train set, and very small model of a model toy theatre. Remarkable. Holland was our guide, telling the story of how the collection was nearly lost but saved by the largesse of the Streeter/Rea family. One should not compare the Leonardslee miniaturisation to the one at Windsor (Queen Mary’s Dolls House). This one is very much the creation of a single individual and takes a different look at the same period of time. Both are to the same scale. Other facilities include tea and refreshment rooms, a gift shop and delicatessen featuring produce from the estate and sourced locally plus a nursery. Wine from the Benguela Cove vineyard is available but the results of newly-planted grape plants at Leonardslee are some years away. If you are taking a holiday in rural Sussex or escaping from the airport, the National Trust has some remarkable properties within a very short distance including Nymans, the home of the artistic Messel family, and Wakehurst, the country estate of the Royal Botanic Gardens Kew. The online entry fee is very good value at £11 , or £34 for a family of two adults and up to five children. Leonardslee is cash free, payment for anything is by card only.